The growth march of Windows 10 slowed this week as gains stalled starting on Monday, according to new data from an Irish analytics firm. Windows 10's usage share, nearly 6.6% on Sunday, dropped to 5.8% Monday, then slipped to 5.7% Wednesday, numbers from StatCounter showed. Week-over-week increases also weakened, falling from healthy gains in both percentage and absolute terms the week before to the lowest since the July 29 rollout of the new operating system. On Tuesday, Windows 10's week-over-week increase fell under 20% for the first time, and its absolute increase in user share slipped under the one-percentage-point bar, also for the first time. Yesterday, for example, Windows 10's user share was 5.7%, or 15% higher than the previous Wednesday. Likewise, the eight-tenths of a percentage point increase between the two was the smallest seen so far in StatCounter's tracking. 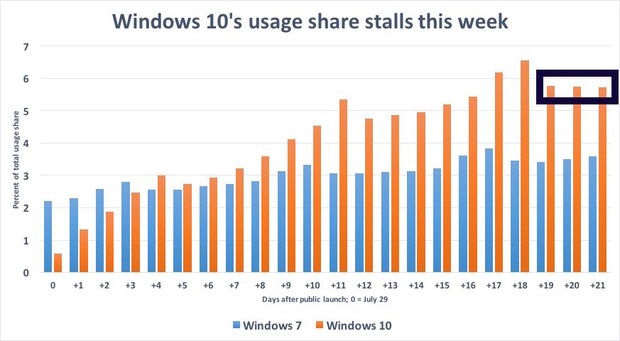 On Wednesday last week -- Aug. 12 -- Windows 10 had posted week-over-week increases of 55% and more importantly, 1.8 points, over the same day the prior week, Aug. 5. The fall-off on Monday from Sunday's peak of 6.6% was normal: Consumer-oriented operating systems, as are the vast bulk of those that have been upgraded to Windows 10, typically peak on weekends, then fall when people return to work where they sit in front of an older OS on their office devices. But the flat line shown by Windows 10 this week was a first. Even as growth slowed last week between Monday, Aug. 10, and Wednesday, Aug. 12, Windows 10 recorded some day-over-day gains, small though they were. However, between Monday, Aug. 17, and Wednesday, Aug. 19, Windows 10 lost about half a percentage point of user share. That did not happen six years ago when Microsoft launched Windows 7. During the first three weeks after its Oct. 22, 2009, debut, Windows 7 grew slower than has Windows 10, but never lost user share except on a Monday following a weekend peak. Interpreting StatCounter's data is inherently risky, in part because it measures Internet activity rather than users. And the numbers continued to show progress by Windows 10. But the stall in gains may point to the end of the easy pickings -- those users who were most eager to upgrade -- and the beginning of a slower tempo of growth, one more similar to the organic gains previous editions have demonstrated. Alternately, the slowing of growth could be Microsoft's doing: The Redmond, Wash.'s upgrade process for Windows 10 is a mystery. It controls when users are notified that they can upgrade, and it has said next to nothing about how it's doing that, at what rate and for how many. While users can sidestep the notification trigger by manually downloading a disk image and installing Windows 10 from that -- essentially jumping the queue -- that's a chore unlikely to be performed by most. For all the outside world knows, Microsoft may have hit the Pause button on upgrades this week. Windows 10's usage share gains flatlined Monday through Wednesday of this week, the first time it not only showed no growth, but actually declined. It may forewarn the end of the easy upgrades.